Produced by the nuclear cauldrons of stars and all matter in the cosmos, energy in the form of electromagnetic radiation permeates our entire universe. Every second of every day we are bombarded with and surrounded by electromagnetic radiation; some bounces off of our bodies, some passes through us, and some we absorb, but most goes undetected and unperceived. Electromagnetic energy travels at the speed of light (2.9x10^8 m/s or 180,000 miles/sec) in the form of a wave. In fact, we classify electromagnetic energy according to its wavelength. Wavelength is defined as the distance between two corresponding points on two consecutive waves. Electromagnetic wavelengths range in scale from that of an atomic nucleus (gamma rays) to that of a small planet (radio waves). A tiny fraction of electromagnetic radiation is visible to the human eye. Only the portion of the electromagnetic spectrum that makes it through our corneas and is absorbed by our retinas is perceived as color and light. Often expressed in nanometers (nm) or one billionth of a meter, the wavelengths of the visible spectrum lie between 400 and 700nm, with red light at the longer end of the spectrum and violet light at the shorter end. A common acronym used to remember the order of colors in the visible spectrum is ROY G BIV (red, orange, yellow, green, blue, indigo, and violet). 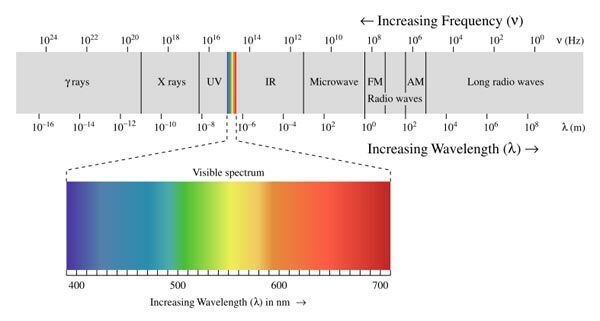 Just below the visible spectrum from 1 to 400nm lies ultraviolet (UV), while just above from 750nm to 1mm lies infrared (IR).